Soil amendments are materials added to soil to improve its physical properties. This can include increasing the water retention, aeration, or other structural elements. The goal of soil amendments is to improve soil to allow for better growth of plants. Amendments must be mixed through the soil. Simply placing the amendment on top, or all in one location will limit its effectiveness. In some cases doing this will actually hinder the movement of water and air through the soil. Many people think of placing mulch on a garden as an amendment, but mulch sits on top of the soil to limit evaporation, runoff, and weed growth. Mulch can be mixed into the soil after a planting season and would then be an amendment. There are two broad categories of soil amendments: organic and inorganic. Organic amendments were alive or in some cases are alive. Inorganic amendments are non-living or man-made. Organic amendments include sphagnum peat, tilled in cover crops, wood chips, grass clippings, straw, compost, manure, and sawdust. 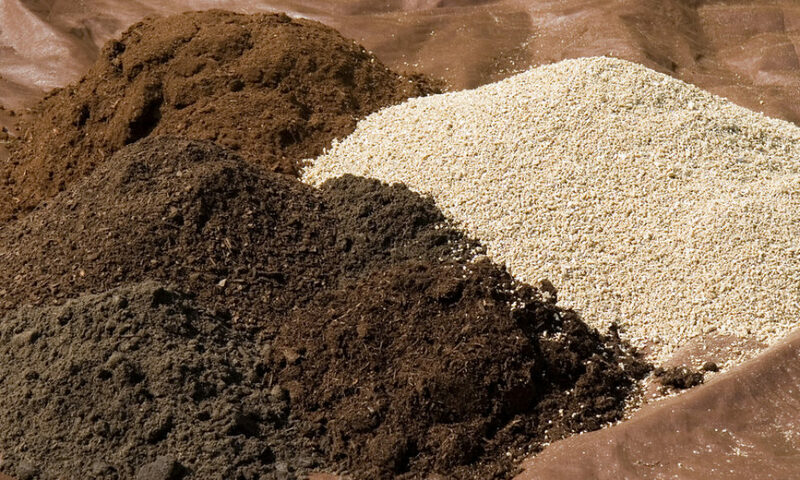 Inorganic amendments include vermiculite, perlite, pea gravel and sand. Organic amendments increase the amount of organic material in the soil. This improves the amount of water and air that can be held by the soil. They also provide nutrients to plants in the soil. As organic matter increases in the soil there is more energy for bacteria, fungi, and earthworms. All of these organisms further improve soils ability to hold air and water. These organisms also help to supply nutrients in useable forms for plants. Inorganic amendments improve drainage and aeration of soil. They do not add organic material to the soil and do little to improve the nutrient levels of the soil. Inorganic amendments can be sterilized to prevent disease or fungus transfer. Weed seeds are also not found in inorganic amendments. The type of soil amendment to use and how much to add to the soil is very dependent on the soil being amended. The other consideration is how you will be using the soil. Amendments needed for a vegetable garden will be different than those needed for a lawn. When deciding if you should amend your soil and what type of amendments to use, it is important to learn as much as you can about your soil. Here are four steps you can take to get the most out of your amendments. Step 1) Complete a Soils Map. You can find out the approximate composition of your soil using the soil mapping tools at websoilsurvey.sc.egov.usda.gov/App/HomePage.htm. Once you determine the type of soil present it will allow you to determine the overall composition. Step 2) Test Your Soil. Soil test kits are inexpensive and will allow you to determine what needs to be added to your soil. To find out more about soil testing visit: pikeconservation.org/stories-field-dont-guess-soil-test/. Step 3) Read More About your Results. Soil tests come back with information about what amendments might benefit your soil. More information about your soil type can be found during your soil mapping. Combined this will give you an outline of what amendments might be needed. Step 4) Follow Directions: If you are purchasing amendments they will usually include directions on the amount to add based on some basic information. Additional information about how much of each amendment to add can be found at extension.psu.edu/publications/uj234.